Daryl Janmaat in action against Sunderland. Daryl Janmaat has given injury-hit Newcastle United a welcome lift ahead of Saturday’s game against Bournemouth. The defender was forced off against Stoke City at the weekend with a knee problem. And the sight of Janmaat hobbling off late in the goalless draw was a troubling one for head coach Steve McClarne. 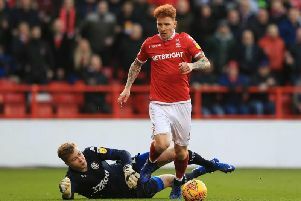 McClaren has lost goalkeeper Rob Elliot to a thigh injury, while left-back Massadio Haidara limped out of an Under-21 game against Aston Villa on Monday night with a groin problem. Janmaat’s withdrawal was precuationary, and the Holland international is being assessed by the club’s medical team. McClaren, however, is confident that the 26-year-old will be available to play at the Goldsands Stadium, where Newcastle will look to climb out of the Premier League’s relegation zone after a difficult two months into the bottom three. With the new season less than three months old, United’s injury list runs into double figures. McClaren lost midfielder Jack Colback to a knee problem last week. Colback will be sidelined for up to six weeks. Speaking about his injury, Colback said: “It’s better than we first thought, so that’s a positive. “I’m disappointed to be injured, but from what it could have been, it’s not too bad. “Where my foot was planted it just twisted the wrong way. It’s unfortunate, but it happens. “It was a feeling I hadn’t felt before, so straight away I knew something wasn’t right. I was trying to stay on, but the physios and doctor told me it was no good and I had to come off. “I had an initial scan where we feared it was going to be a bit longer.